Verse 1: In the third year of Cyrus king of Persia a thing was revealed unto Daniel, whose name was called Belteshazzar; and the thing was true, but the time appointed was long: and he understood the thing, and had understanding of the vision. 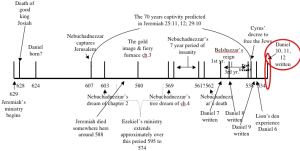 Daniel, speaking in the third person tense, reminds us that he was also “called Belteshazzar,” the same person who was named that way in chapters 1:7; 2:26; 4:8, 9, 18, 19 and 5:12 by king Nebuchadnezzar. Therefore, he was the same one who wrote this chapter and the next two. At this point, we need to be reminded that all three chapters, 10, 11 and 12, with all evidently having been written in the third year of Cyrus, could actually be combined into one chapter. Note again that the beginning of this chapter is the last place Daniel indicates where he stood time wise. In fact, chapter 10 could be considered introductory to that of chapter 11 with chapter 12 being a conclusion to the whole matter. Obviously, it was the “vision” of chapter 8 that caused him to be “astonished,” but he had not “understood.” He now understood it because of the “skill and understanding” (Daniel 9:22) Gabriel provided in chapter 9 verses 24 to 27. But, while it was clear to Daniel, it is somewhat vague to many of us. With that in mind and having learned in Daniel 8:26 that the “’mar’eh’ of the evening [ereb’] and the morning [boqer] is true” is the 2300 “days [ereb’/boqer]” of Daniel 8:14. Therefore, we can know with certainty that the “vision” Daniel now understood in the first verse of this chapter is the 2300 days of Daniel 8:14. Daniel also states that “the time appointed was long” can only be applied to the 2300 days of Daniel 8:14, the longest time prophecy in the Bible. So, having gained the “skill and understanding” of the 2300 days, he also learned that the “seventy weeks” or 490 years was the first part of the 2300 years, set aside as probationary time for his people to realign themselves with God’s plan for them. The things expected of them is listed in Daniel 8:24, which, if they had fulfilled, the remainder of the 2300 years or 1810 years would not have been required. It is logical for us to conclude, that as far as Daniel was concerned, the 490 years and 2300 years began three years before in Cyrus’ “first year” as noted in Ezra 1:1 when he proclaimed liberty to the Jews at the end of the “seventy years” in 536 BC. But, from our perspective in time, it was 457. That should put us on notice that setting a time for any of the time prophecies concerning the future could just as easily be misunderstood and become a real stumbling block to us although to Daniel it would have been irrelevant because of the length of time involved. Verse 2: In those days I Daniel was mourning three full weeks. This being “the third year of Cyrus,” one year had elapsed since Darius’ (the Median Daniel 5:31) and Cyrus’ “first year.” In Cyrus’ “first year” (536 B.C.) “the LORD stirred up [his] spirit. . . that he made a proclamation throughout all his kingdom, and put it also in writing, saying, . . .The LORD God of heaven hath . . . charged me to build him an house at Jerusalem, which is in Judah. Who is there among you of all his people? his God be with him, and let him go up to Jerusalem, which is in Judah, and build the house of the LORD God of Israel . . .” (Ezra 1:1-3). Now, with Cyrus having issued his decree three years ago, we would expect Daniel would now be expressing gratitude for God’s merciful forgiveness and that He had not forsaken His people or the “city Jerusalem, thy holy mountain: because of our sins, and for the iniquities of our fathers . . .” (Daniel 9:16). But, as this verse indicates, his anxiety and concern seems to be greater than ever in spite of Cyrus’ providential decree. Evidently, things were not going well in Jerusalem where his people had gone to repair the city of Jerusalem. Although the Jews had departed some two to three years before, word came back that the “adversaries of Judah and Benjamin” had “weakened the hands of the people of Judah, and troubled them in building.” They even ‘hired counselors against them to frustrate their purpose, all the days of Cyrus . . .” While that was extremely troubling to Daniel, their obstructionism continued even “until the reign of Darius king of Persia” (Ezra 4:1, 4, 5)  whose reign began 14 years later in 522 BC. Before that time, Daniel had probably been laid to rest, therefore, it appears, slowing of the rebuilding program continued on in spite of Daniel’s great concern. But, as concerned as he was, it should not have been surprising to him because Gabriel had told him it would be rebuilt “even in troublous times” (Daniel 9:25). But, heaven had not turned a deaf ear to Daniel’s prayers. The marvelous prophesies of chapters 11 and 12 spell out many things other than the destiny of Jerusalem that God wanted Daniel and all those who studied his prophecies, to know. In fact, we will discover these prophecies will extend even beyond the “mar’eh” even on into the “end” of the “chazown,” future even to us! Verse 3: I ate no pleasant bread, neither came flesh nor wine in my mouth, neither did I anoint myself at all, till three whole weeks were fulfilled. Not only was Daniel noted for his wonderful prayer life, as we saw in Daniel 6 and 9, he was also very persistent in expressing his deep desires to God. Even though he does not explicitly tell us what was on his mind, God knew, and that was what was important. Evidently, while Gabriel had already told him “the street shall be built again, and the wall, even in troublous times,” news of the “trouble” that came to Daniel probably seemed worse than what Gabriel had depicted. So, he again set himself to learn more and implore God’s intervening hand in behalf, we can assume, of His people. To heighten the acuity of his mind, leaving all that might distract, he followed a very plain, simple diet leaving off what we might call cake, ice cream and cookies, partaking only of vegetables and only water instead of grape juice. In the “third year of the reign of king Belshazzar” he “was by the river of Ulai” in the province of Elam” (Daniel 8:1, 2). Now, he is “by the side of the great river . . . Hiddekel,” which is the Tigris. So he must have been near Babylon, although he does not say exactly where. Verses 5 & 6: Then I lifted up mine eyes, and looked, and behold a certain man clothed in linen, whose loins were girded with fine gold of Uphaz: His body also was like the beryl, and his face as the appearance of lightning, and his eyes as lamps of fire, and his arms and his feet like in colour to polished brass, and the voice of his words like the voice of a multitude. That statement, linking this chapter with Revelation 1:9-15, is extremely relevant for us in our day because Daniel 10, 11 and 12 are really one unit, with this chapter actually introducing the next two. Therefore, we have before us a rich record of things of extraordinary importance for us living in these last days. Note again that “this knowledge was given to Daniel and recorded by inspiration FOR US” who are living in the last days of this world’s history. Therefore we do well to study them closely. He was the One who instructed Gabriel to “make this man to understand the 2300 day “mar’eh” in verse 16. 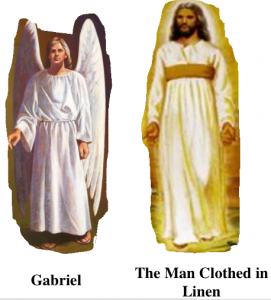 Here, being “clothed in linen” indicates His priestly role in the heavenly sanctuary typified in the earthly where Aaron and his sons (Exodus 28:4, 5, 6, 8, 15, 39, 42) were also clothed with “holy garments” made of “fine linen.” This material was also one of the chief articles composing the sanctuary itself and even “the court of the tabernacle” was surrounded with and enclosure “of fine twined linen of an hundred cubits long [on each]side” (Exodus 27:9). It seems clear, therefore, that Daniel must have understood the association between Christ’s clothing, and His priestly ministry even though his mind was possibly fixed on the earthly sanctuary in “Jerusalem” as noted in Daniel 9:2 thinking the sanctuary services might be delayed for another 2300 years. It is well to note that while the “Lamb” is depicted 100 times in the entire Bible, it is not mentioned even once in Daniel, while the “Lamb” is depicted twenty seven times in the book of Revelation! The only time in the book of Daniel where Christ’s crucifixion is implied, is found in Daniel 9:26 and 27 where the “Messiah” is “cut off” and His confirmation of “the covenant” that took place “in the midst of the week.” So, while Daniel was confronted by these two marvelous beings, with Christ being no less than the “son of God,” it must have been difficult for him to see Him represented by a slain Lamb. Verses 7, 8 & 9: And I Daniel alone saw the vision: for the men that were with me saw not the vision; but a great quaking fell upon them, so that they fled to hide themselves. Therefore I was left alone, and saw this great vision, and there remained no strength in me: for my comeliness was turned in me into corruption, and I retained no strength. Yet heard I the voice of his words: and when I heard the voice of his words, then was I in a deep sleep on my face, and my face toward the ground. Note the word “vision” used three times in these verses and once in verse 16. It is translated from the Hebrew word “mar’ah”  which, although very similar to “mar’eh,”  is not the same. Therefore we cannot assume that the Lord was about to reveal more information about the 2300 day “mar’eh” that he says he understood in verse 1. Therefore it seems, some other, more advanced things were about to be reveled to him. Note the similarity of Daniel’s reaction to that of Daniel 8:17, 18 when Gabriel approached him. In this case, it was the Lord Himself who approached him. If Daniel, being the great man that he was, was so overcome in the presence of Deity, what would it be like for us? We can never handle the Lord’s name or His words with too much respect and reverence. Verse 10: And, behold, an hand touched me, which set me upon my knees and upon the palms of my hands. Verse 11: And he said unto me, O Daniel, a man greatly beloved, understand the words that I speak unto thee, and stand upright: for unto thee am I now sent. And when he had spoken this word unto me, I stood trembling. Five years before, in the “first year of Darius,” Gabriel had also said “thou art greatly beloved” (Daniel 9:23), and he will repeat it again in verse 19 of this chapter. Even though Daniel was at an advanced age and probably quite weak, heaven did not lose interest in him. As we shall see in the next chapter, Gabriel was soon to open before him what could arguably be called the most marvelous revelations of the future of all time. Men, even today are still struggling to understand much of it, and we will join them in that struggle, knowing that God’s purpose in giving these revelations was not to confuse, mystify, or puzzle, but to strengthen faith. Verse 12: Then said he unto me, Fear not, Daniel: for from the first day that thou didst set thine heart to understand, and to chasten thyself before thy God, thy words were heard, and I am come for thy words. Note again that the city would “be built again” in spite of the “troublous times” (Daniel 9:25) Daniel was concerned about. So, even though things didn’t look good from Daniel’s perspective, they were still under the control of God who knew all along what was happening and what was going to happen to his beloved city. Verse 13: But the prince of the kingdom of Persia withstood me one and twenty days: but, lo, Michael, one of the chief princes, came to help me; and I remained there with the kings of Persia. According to the Commentary, “the prince of the kingdom of Persia” could either be a demon, or Cyrus, the king of Persia while the Spirit of Prophecy favors the former noting here we are “given a glimpse of this mighty struggle between the forces of good and the forces of evil. For three weeks Gabriel wrestled with the powers of darkness, seeking to counteract the influences at work on the mind of Cyrus;” which, obviously were demonic. Who, then was “Michael?” He was “Christ Himself [who] came to Gabriel’s aid” the same Person who appeared to Daniel as a “certain man . . . clothed in linen” (verses 5, 6) just before Gabriel touched him. Verse 14: Now I am come to make thee understand what shall befall thy people in the latter days: for yet the vision is for many days. He meant no such thing if we recognize in verse 1 that Daniel understood the 2300 days “mar’eh,” while here, Gabriel says he is “come to make [him] understand . . . the ‘chazown'” that is “yet . . . for [more] many days [yown]” beyond the 2300 days [‘ereb boqer] “mar’eh” of Daniel 8:14. 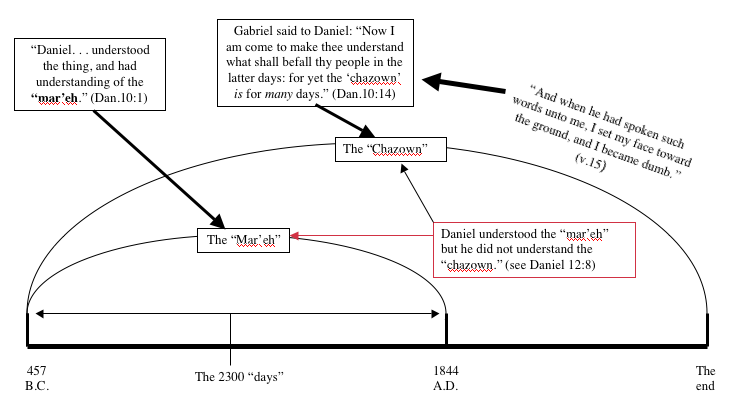 Go back again and check out Daniel 8:26 where “the ‘mar’eh’ of the [2,300] evening and the morning is true; wherefore shut thou up the ‘chazown’, for it shall be for many days” which virtually repeats what Gabriel says here about the “chazown.” While Daniel did understand the 2300 day “mar’eh,” he did not comprehend the “chazown” as implied in Daniel 12:8 where he says “I heard, but I understood not.” Therefore, what was to “befall” his “people” during post 2300 “days” time, is what Gabriel now comes to explain. The Commentary suggests: “The emphasis of this final clause of the verse is not so much upon the length of time in prospect, as upon the fact that the Lord has still further truth to be conveyed to Daniel by a vision.” “Further truth to be conveyed” to be sure, but “length of time” is also “in prospect” if we take into consideration the parallel that exists between this verse and the “chazown” in Daniel 8:26. 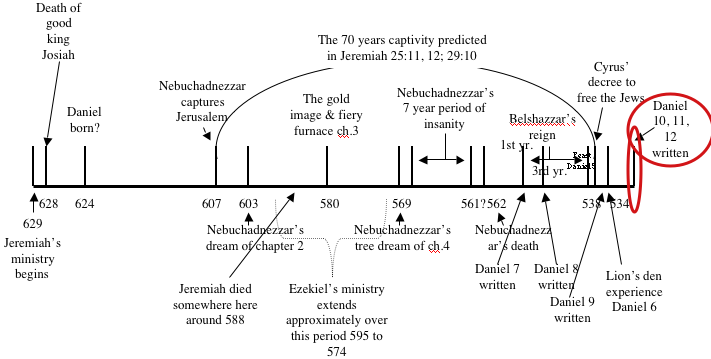 Therefore, the thrust of Gabriel’s message did have something to do with “the length of time in prospect” as well as “further truth to be conveyed to Daniel by ‘the chazown’” which is inclusive of all the prophetic details depicted in Daniel 8 from the “ram” of Daniel 8:3 to the very “end” (Daniel 8:17) of time; whereas the “mar’eh” (that Daniel “understood”) covering all those details, came to its end October 22, 1844. Verse 15: And when he had spoken such words unto me, I set my face toward the ground, and I became dumb. In other words, while he fell to the ground just as he did in Daniel 8:17, he now “became” speechless. So, while he “was astonished at the ‘mar’eh’” in Daniel 8:27 and had resigned himself to in in Daniel 10:1, Gabriel’s reference to the “chazown” here was even more astounding! Although this was the second time he was overcome, this time when he “set [his] face to the ground” and almost had had a stroke which could have been fatal were it not for Gabriel’s help. Verse 16: And, behold, one like the similitude of the sons of men touched my lips: then I opened my mouth, and spake, and said unto him that stood before me, O my lord, by the vision my sorrows are turned upon me, and I have retained no strength. This Person, who bore “the similitude of the sons of men” must be the “certain man clothed in linen” of verse 5 which was the Lord Himself. Note that he “touched” Daniel’s “lips” enabling him to speak, or, if Daniel actually had had a stroke, he immediately recovered because of the healing touch of the Savior. The incident reminds us of “the LORD” who asked Moses “Who hath made man’s mouth? Or who maketh the dumb . . . have not I the LORD?” (Exodus 4:11). Then, regaining his power of speech, we might paraphrase Daniel’s words to say: the great sorrow brought to me by “the vision [mar’ah]” has nearly killed me. In other words, what he heard 16 years before in the “third year of king Belshazzar” (Daniel 8:1) and “in the first year of Dairus” (Daniel 9:1) was bad enough. This news is even worse! But, it should be good news for us! because Gabriel’s messages extend to our time and even beyond! So, like Daniel, we have much more to learn. Verse 17: For how can the servant of this my lord talk with this my lord? for as for me, straightway there remained no strength in me, neither is there breath left in me. So, while the Savior’s healing touch enabled him to speak and give utterance to his sorrow, he was still very weak, and could hardly breathe. Verses 18 & 19: Then there came again and touched me one like the appearance of a man, and he strengthened me, And said, O man greatly beloved, fear not: peace be unto thee, be strong, yea, be strong. And when he had spoken unto me, I was strengthened, and said, Let my lord speak; for thou hast strengthened me. At first glance, we might suppose this is still the Lord who “touched” Daniel. But, reading ahead to verse 21, it appears this is Gabriel who also “touched” Daniel in chapters 8:18, 9:21 and 10:10. It was the Lord who only “touched” Daniel’s “lips” in verse 16. It is interesting, isn’t it? how Jesus and His right hand man Gabriel worked together in ministering and informing the beloved prophet Daniel. So, both the Lord and Gabriel ministered the healing “touch” to Daniel. Verse 20: Then said he, Knowest thou wherefore I come unto thee? and now will I return to fight with the prince of Persia: and when I am gone forth, lo, the prince of Grecia shall come. So, in this one verse, Gabriel covered the sweep of history represented by the “ram” which just recently took over power in 539 BC, in Daniel’s time, to the “he goat” which conquered the Persian Empire 217 years later in 322 BC. “The Bible is the most ancient and the most comprehensive history that men possess. It came fresh from the fountain of eternal truth, and throughout the ages a divine hand has preserved its purity. It lights up the far-distant past, where human research in vain seeks to penetrate. In God’s word only do we behold the power that laid the foundations of the earth and that stretched out the heavens. Here only do we find an authentic account of the origin of nations. Here only is given a history of our race unsullied by human pride or prejudice. Verse 21: But I will shew thee that which is noted in the scripture of truth: and there is none that holdeth with me in these things, but Michael your prince. Therefore, while Gabriel first referred to “the prince of Persia” followed by “the prince of Grecia” in verse 20, he didn’t stop there, as we shall see in the next chapter which is in addition to this chapter with no intervening break in the sequential relationship between chapters 10 and 11. Summary of chapter 10: This chapter, since there is no division between them, is the introduction to chapters 11 and 12. It begins with Daniel affirming that he understood that what were learned earlier, is the 2300 day “mar’eh” of Daniel 8:14. He then relates his encounter with Jesus, the “man clothed in linen,” and Gabriel who came to inform him about the “chazown” vision that we learned, particularly in Daniel 8:17 and 26 was “for the end.” This information nearly prostrated the prophet, but he recovered under Jesus’ and Gabriel’s healing hands. These dates are from the SDA Bible Commentary Vol.4, page 856. But, according to Ussher, its was 534 B.C. So, take your pick! “vision” from “mar’eh” (Strong’s #4758) “appearance x35, sight x 18, countenance x11, vision x 11, favoured x7, look upon x4, fair x 2, misc, x15. “latter days” from “‘achariytha” Strong’s #319 and “yowm” #3117. “Achariytha” is translated “the last end” in Daniel 8:19; “latter time” in 8:23; “the end” in 12:8. “Yowm” which is almost always indicative of a 24 hour “day” is used in Daniel 8:26, 27; 9:7, 15; 10:2, 3, 4, 12, 13, 14; 11:20, 33; and most importantly in 12:11, 12, and 13.
 if we omit the supplied words “shall be” the meaning remains the same even though the remaining phraseology becomes rather rough. Go back and review our discussion of Daniel 8:26 to see where we got all this if you are unfamiliar with it or had forgotten. “latter” from: “’achariyth” (Strong’s #319) “end x31, latter x12, last x7, posterity x3, reward x2, hindermost x1. It is translated “end” in Dan.8:19; “latter time” in 8:23; “posterity” in 11:4; and “end” in 12:8. “days” is translated from “yowm” (Strong’s #3117) the same word for “days” in the last part of Daniel 8:26. of the 2287 times it is found in the Old Testament, the great majority of which, it refers to a literal 24 hour period of time such as we see in Genesis 1. Less often, it can refer to a “year” or a general period of time. note that “many” in Daniel 8:26 is not a supplied word while “many” in Daniel 10:14 is supplied. Therefore, it seems to me, it is allowable to treat “many” in Daniel 10:14 as an unsupplied word. note that “vision” here is translated from “mar’ah” (Strong’s #4759) not “mar’eh” (Strong’s #4758). “Mar’ah” is the same word translated “vision” in verses 7 and 8 which seems to be intermediate between the “mar’eh” and the “chazown,” and therefore more nonspecific as compared to the 2300 day “mar’eh” in 8:16, 26, 27 and 23 or the “chazown” of 8:1,2, 13, 15, 17 and 26, of the very end of time.